The west coast studio looked perfectly fine, until I started rearranging it again...for the third time, this year. I moved all the furniture around and hope I'm happy with this arrangement. Everything got moved closer to the windows again....the view is really lovely. I hung up a curtain rod, with rings and clips, so that I could diplay quilts. The plan is to make a hanging design wall, that can be hung, on the same rod. Since this room doubles as a guest room, it will be nice to be able to take the design wall down at will. I'll have to test that theory out. The question is..... how many times can one arrange one little room???? The Free Bee block for June has a limited palette, which is unusual for me. Lynne asked us to make a twelve inch block, in black and white, with a pop of red. No other restrictions...I'm not used to restricting my colours, so a bit of a challenge there. I hope you like it Lynne. I'm back on the West Coast...without my shot cottons. I was planning to grab a handful, for the June Free Bee block, on my way out the door, but got distracted. Here is what I managed to dig up, from my stash out here. It's a start and it's already nearing the end of June...yikes when did that happen?? After handling scraps all week.....I just couldn't resist a little scrap play. It's well after midnight and I should long be in bed, so please forgive the photo quality. I think I'm under or out of control, depending on how you look at it. Seriously, I dedicated thirty three buckets to scraps...try thinking of that many categories. I'm tired and haven't even started sorting the bulk of the scraps, that should theoretically end up in the thirty three buckets. There are lots of helpful books written on organizing us quilters, you'd think we have a reputation for being overrun by fabric or something. From all the reading I've done and my own personal experience, I think it's important to ask your self what kind of quilter you are? One project at a time or multiple like me. What type of buyer are you? Just enough fabric per project or the 58 meters, in one shot type, like me....surely there are others of you out there. How do you work on a project? 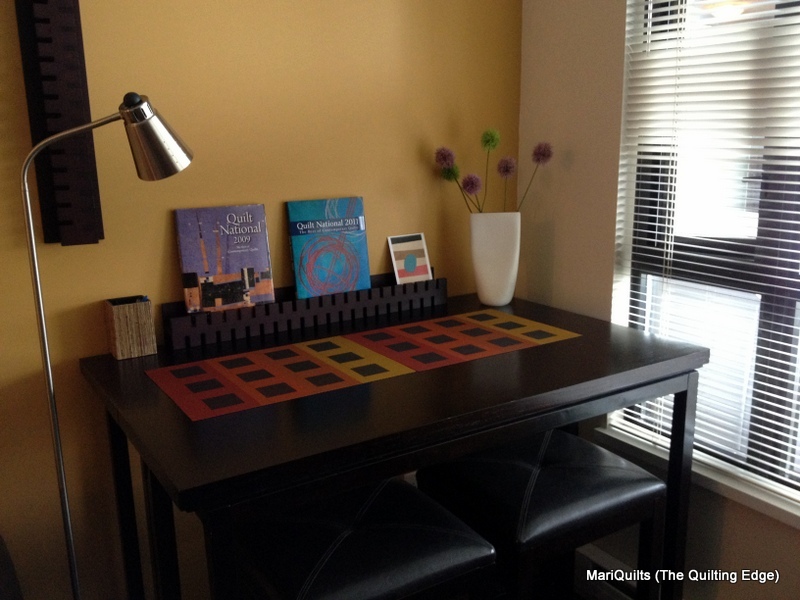 The book Organizing Solutions for Every Quilter gets you thinking about some of these things. 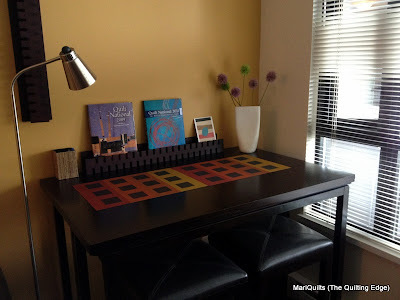 In order for your work space to work for you it should be personalized for you. Even if you only have a small corner in your house (trust me, I used to be there), it helps if you understand your personal habits and needs. Just a quick example, the book Cut the Scraps, has you cut your scraps into nice neat consistent squares & rectangles, of various sizes, that all work together, making some of the really lovely quilts, in the book. It's really a well thought out system, but I want wonky scraps for more improvisational type work....so that's not the best thing for me. Both of these books are fabulous and very helpful. Now for sorting some scraps....maybe tomorrow. I Gotta Get Me A System...Scrap System that is. After all these years of quilting, I've never bothered to deal with the scraps....they are out of control. My studio usually looks pretty neat, unless I'm in a creative funk, which happens on a regular basis. Normal people clean up after finishing a project...that doesn't work, all that well, for us multiple project types. You know...many starts and not so many finishes. How have I managed to look so organized and neat all this time? My answer is containers, of all sizes and shapes. My husband calls me the "Container Queen", he tells our friends that I buy containers to hold my containers. Between us...he is absolutely right. But, my container system is failing me miserably...it's out of control. For example, this bucket is sitting full of fabric for a project I made and actually finished last Christmas. These type of containers are lurking in hidden or not so hidden places all over my studio, really I'm serious. I'm actually afraid to count them, and lets not even mention the project bins. I have space dedicated to yardage and ongoing projects but, as I was planning, I realized I have never put a working scrap system, the operative word being working, into place. 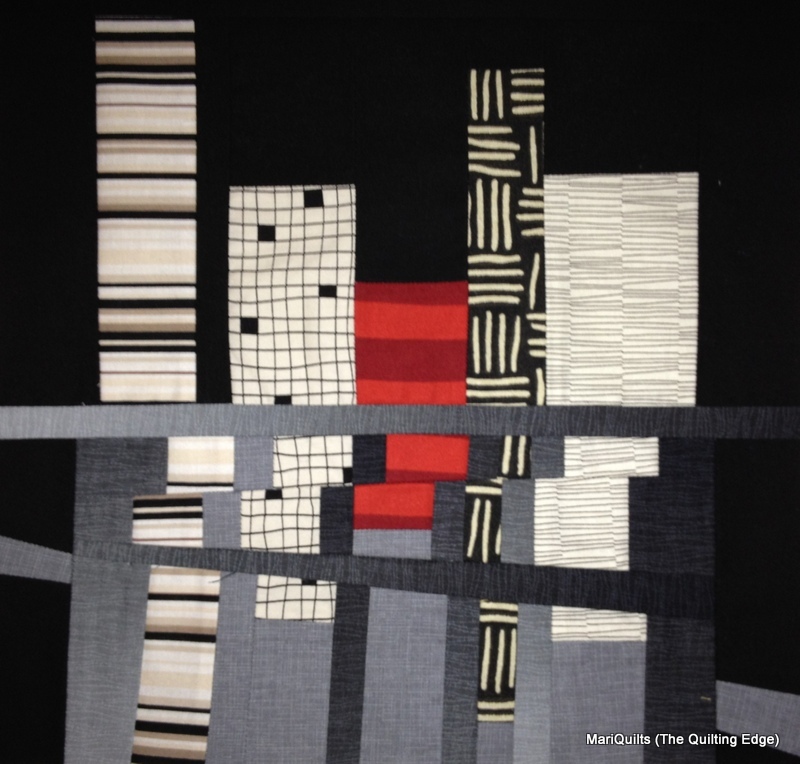 Spurred on by reading Sunday Morning Quilts, I woke up with renewed vigour, ready for action. The first thing I did, was go to the Chiropractor....then out shopping for more containers, of course. There was some dead wall space that was perfect for the new "system". There she be...all ready to be carried downstairs and assembled. Darn, where is that man when I need him?? I can carry this stuff...and use a screwdriver, did I ever mention, I have my own drill? Now isn't that just a sight for sore eyes??? All ready for me to sort my scraps. I'm just wondering why I didn't do all that, before I went to the Chiropractor. It's certainly an ever growing problem, in my studio. If that's the case in your space, Sunday Morning Quilts is the book for you. Cheryl Arkison and Amanda Jean Nyberg have written a wonderful book, addressing the ever-growing scrap problem, with some great storage ideas and plenty of fresh and innovative projects. Fortunately for me, Cheryl was in town for a book signing and trunk show, this evening. It was so lovely to meet Cheryl and see her beautiful quilts in real life.....so much fun meeting a fellow blogger. Two of my fellow "BLOCKHEADS" petting the lovely quilts. And since no trip to the fabric store would be complete without the words "I'll take the rest of the bolt" leaving my mouth......well let's just leave it at that. Might I mention, that the sales clerk said " Oh I remember you...you're the lady that bought 58 METERS of fabrics!!!" Yikes, I'm starting to get I have a reputation!! 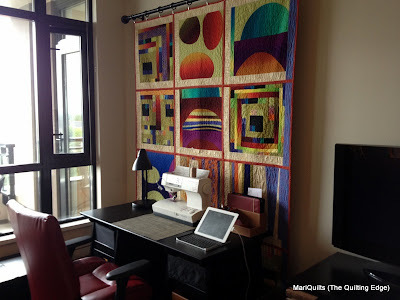 Does Your Home Life, Reflect Your Quilt Life? Or is it the other way around? Which ever way it is, I know mine sure does.....would you look at the fabulous area rug I bought today!! When I showed the sales clerk the photo of the fabulous Eric Klemm painting (which we bought about ten years ago) hanging in my living room, she quickly tried to steer me to a more "neutral" rug. How could I explain...neutral and I are not compatible!! Without thinking I spurted out "I'm an artist...I need colour!" I then proceeded to scroll over to my pictures of Colour Shot, she took one look and said "ahh, I understand". At first glance, she thought it was a painting rather than a quilt and asked me if I had business cards.....hmm, I'll have to think on that, but I digress. As you can see my quilter's heart won out. And there on the black chair sits Colour Shot looking right at home. I'm thrilled!!! Colour Shot won favourite in the Pieced Quilt Category, in the Bloggers' Quilt Festival this year. This quilt was a joy to work on, from beginning to end. Thanks so much, to all of you, that took the time to vote and most of all a huge thank you to Amy, for putting on such a wonderful event. 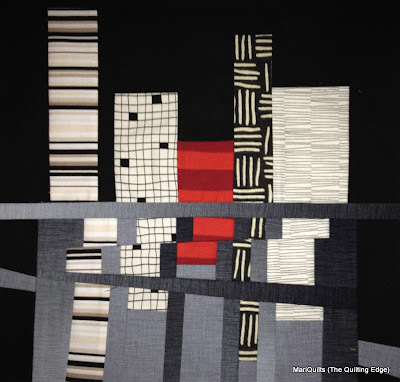 There were so many truly amazing quilts, in the festival.....I'm honoured that Colour Shot was one of the winners. What to work on next??? I always feel a little lost after a large project....not quite sure what to tackle next and what direction to take. This amazing block from Penny of Sewtakeahike arrived last week.....meaning all my Free Bee Blocks are here!!!! !